Le Coin House is located at the end of a dead-end road, on a little square by the banks of a river. The hamlet of Hameau de Dreuilh is made up of about fourteen houses, so it's a wonderfully quiet area. 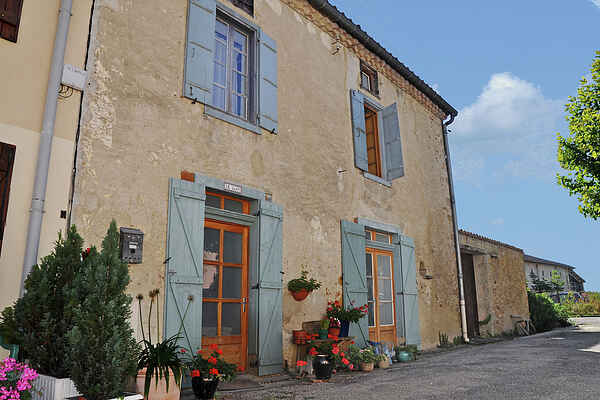 For daily shopping you will find a small supermarket with a bakery in the adjacent village of Rieucros. Le Coin makes an excellent base for excursions and hikes. You can explore the hills around the house or head high into the Pyrenees (about a one-hour drive). Mirepoix, located nearby, is a picturesque little town with a weekly market every Monday morning. Toulouse and Carcassonne, with its medieval Cité, are also close by. And you don't have to drive far to reach the sea. Narbonne beach is one hour away and there are many other little beach towns north and south of Narbonne. The house has a pleasant living room, furnished in a cosy and comfortable design with a nice sitting area round the open fireplace. The French doors provide direct access to the sunny garden, where you will also find shady places to shelter you from the sun. The ground floor contains a spacious bedroom and a bathroom and there are also two large bedrooms on the first floor, one of which has its own bathroom. A wonderful spot!